Here's the following simple tips on how to do a factory reset or format the Samsung Galaxy S Plus I9001 and restore it back to it's original factory default settings. This procedure may help if you'll experience some slow performance, fix lags, hang or frozen issues. This may also wipe any unwanted firmware interruption due of some applications you've installed on the phone that result to some poor performance issues. Note: Just ensure to back up all of your important data stored from the phone, for this will wipe it all out and clear you device and stored back again like the first time you bought it. Factory reset - this is only a soft reset method, you can do this if the device is still active or you can still navigate to it's menu and settings function. You can also do a factory reset while only typing this reset code onthe dial pad #2767*3855#. 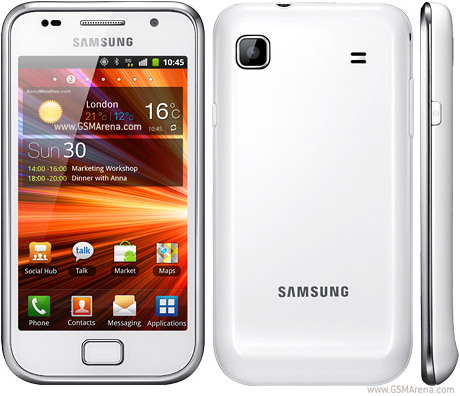 If the Samsung Galaxy S Plus I9001 is frozen or stuck on boot or hangs on welcome screen logo only. This time you will need to hard reset it by way of button combination since you cannot do a factory reset from the instruction above. Turn your Samsung Galaxy S Plus I9001 off, or remove the battery for about 10 seconds then put it back again. Then press and hold the following buttons Home button + Volume up + Power button. Then a menu will show, just select Wipe Data/Factory Reset.